BOLTON, Ontario – Husky Injection Molding Systems today announced the official launch of its next generation HyCAPTM system for high output beverage closure manufacturing. Originally introduced at NPE 2012, the HyCAP system complements Husky’s existing suite of beverage closures products and is now fully commercially available to its global customer base. Husky’s launch of the next generation HyCAP system marks the first product to take advantage of the addition of closure moldmaker KTW. This relationship has made Husky the industry’s only provider of complete injection molding solutions for beverage closure manufacturing, including machine, mold, hot runner, temperature controller, as well as process and productivity monitoring software. Unlike other suppliers, Husky is able to take responsibility for the entire system to provide complete melt stream control and reduce variability in the injection molding process, resulting in increased productivity, reduced waste and improved part quality. Changes have also been made to the HyCAP hot runner, including modified insulation technology and heating requirements, to reduce energy consumption. Husky’s enhancements to further improve the accuracy, precision and repeatability of the injection molding process has helped to further strengthen the position of this technology when compared to competitive molding methods. By supplying a complete integrated solution, Husky has been able to streamline how each discrete component works together to deliver industry-leading cycle times. 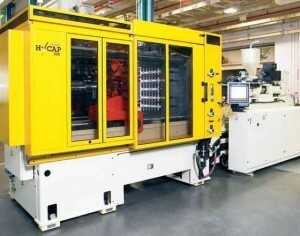 The next generation HyCAP system has benefitted significantly from the combined capabilities of Husky and KTW by featuring a new mold design that improves the productivity of the overall operation. The progressive design of the mold maximizes uptime by eliminating unnecessary stoppages and allows for quick and easy maintenance. The mold also incorporates specific features to provide easy set-up and mold longevity while eliminating the need for sensors to monitor specific components.